With Halloween at the end of the month, kids all over America are licking their lips in anticipation of stocking up on their favorite candy. Parents, it’s okay to indulge too, but you have to watch out for your family’s oral health during this time of sugar and sweets. With 35 million pounds of candy corn made for each Halloween, it’s no wonder there’s an increase in cavities and other dental issues during this holiday. 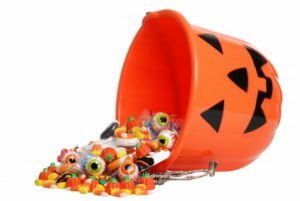 Read on to learn some tips on how you and your family can have a happy (and healthy) Halloween from your local dentist. Try to time out your candy craving around mealtime. When eating, your mouth produces more saliva which helps to wash away acids produced by bacteria and food debris from eating candy. Save your candy as a treat for dessert or some type of reward instead of snacking on it throughout the day. Snacking throughout the day, especially on sugary candy, can increase your chance of cavities and tooth decay. Avoid hard candy or candy that stays in your mouth for long periods of time. Keeping candy in your mouth consistently, other than sugar free products, will increase your chance of tooth decay because your teeth are in constant contact with sugar from the candy. After trick-or-treating, you and your loved ones can go through the candy stash and pick out everyone’s favorite candy. The rest of the candy can be donated to food shelters to help those in need. This is a great way of giving back, but also limiting the amount of candy your family can eat. If you’re already indulging in candy, limit the rest of your diet to healthy foods. Your body, teeth, and gums will thank you. Additionally, drink fluoridated water. This will help protect and strengthen your enamel, plus, water naturally washes away bacteria on your teeth and gums. Brush your teeth twice a day and floss once a day. If you weren’t already, it’s important to clean your teeth when you’re eating more sugary foods. Flossing will help remove food debris and bacteria that can’t be removed by brushing. Another part of your oral health routine should be regular dental checkups and cleanings. Especially after Halloween, make sure your children see a dentist to check for any cavities or decay. Seeing your local dentist is a great way to prevent more serious issues from happening in the future. Use our above tips to make your Halloween a healthy one. You and your family can still indulge in the festivities, but you can use the above suggestions to keep everyone’s smile healthy looking and feeling! Dr. Nelson Y. Howard enjoys caring for his patients in San Marcos and Rancho Bernardo. Specializing in cosmetic dentistry, he likes to help people improve their confidence with a renewed smile. He understands the importance of preventive checkups to catch issues while they are still small. He currently runs his own practice where he can be contacted through his website or by phone at (760) 599-6559 for any questions.